1. Heat 1 tbsp of olive oil in a medium skillet on medium-high heat. Add the onions, brown sugar, salt and pepper and stir with a spatula to combine. Cook about 10-15 minutes, stirring frequently, making sure not to burn onions. Cook until onions are well-caramelized. 2. Preheat broiler and place rack in center of oven. Spread about 1 tbsp of butter on each half of each Dutch Crunch roll. Place the rolls on a baking sheet, butter-side-up, and toast until golden, about 1-2 minutes. Watch carefully, they toast fast! 3. In a medium bowl, combine the beef with the Worcestershire sauce, rosemary, thyme, and shallot. Season with salt and pepper. Divide into 6 equal patties. 4. Heat remaining 2 tbsp of olive oil in a large skillet over medium-high heat. Cook the sliders for 3 minutes on the first side. Flip sliders, top with 2 slices of cheese each and cook another 2-3 minutes. 5. Using a serrated knife, cut each roll in half crosswise, so that each roll makes 2 buns. 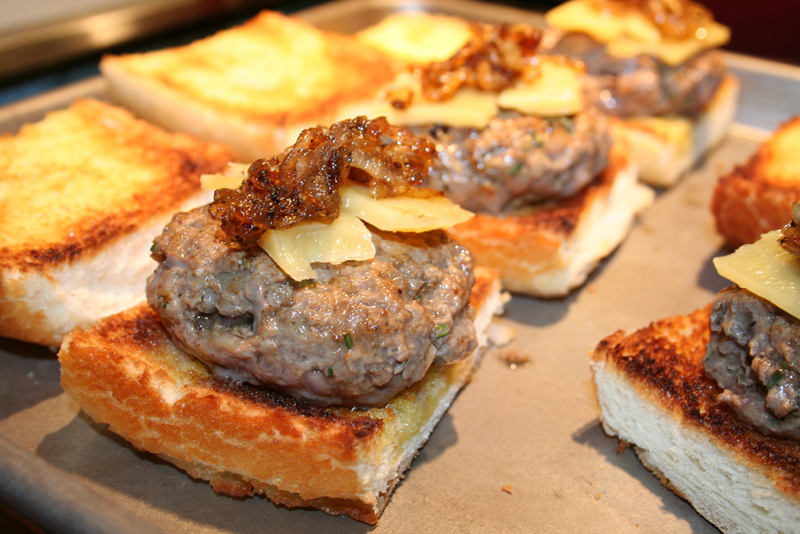 Place slider patties on bottom bun, then top with caramelized onions and bun top. Serve warm.